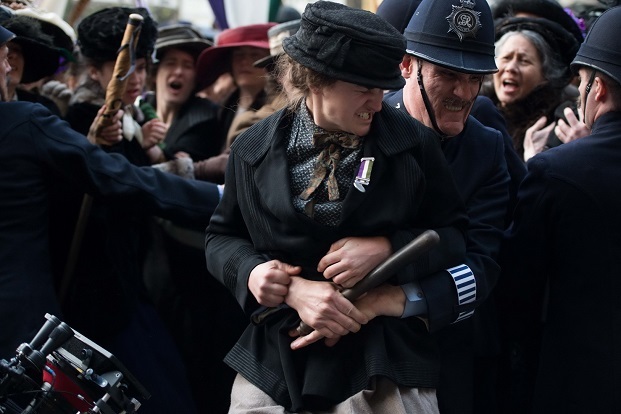 SUFFRAGETTE is an intense drama that tracks the story of the foot soldiers of the early feminist movement. It focuses on the women who were forced underground to pursue a dangerous game of cat and mouse with an increasingly brutal State – it is a sage reminder of what women had to do to get some basic rights. Fighting for the right to vote, these women were not only from the genteel educated classes, there were working women among them who had seen peaceful protest achieve nothing. Radicalised and turning to violence as the only route to change, they were willing to lose everything in their fight for equality - their jobs, their homes, their children and their lives. Maud was one such foot soldier. When Maud is sent out to deliver a parcel, she finds herself in the middle of a riot in Central London – the first militant protest at having their decades-old request for the vote ignored by successive governments. Both shaken and quietly inspired by the protest, Maud is stunned to see a fellow laundry worker Violet in the crowd of militants. Sensing her interest, Violet convinces Maud to join the fight and become one of the foot soldiers, even at the expense of her marriage and being a mother. She’s further drawn into the struggle when she’s introduced to the inspirational Edith, a local chemist who together with her husband operates a covert base for the Suffragettes in the back room of her shop. Carey Mulligan as Maud is the centrepiece of this movie and she is truly inspirational in this role, watching how she thinks it is none of her business, but realising that the very place in which she works has abuse of women, not to mention the injuries and diseases (not a place for the faint-hearted), for which she can do nothing about, and so her journey towards the fight begins. She plays the downtrodden mother and laundry factory worker from the East End (then one of the poorest areas of London) with such grit and determination that you completely forget all her previously plummy accent roles and believe in every bit of blood, sweat and tears she puts into this role. There is also a great supporting cast, with Helena Bonham Carter as Edith, Ben Whishaw as her husband Sonny, Anne-Marie Duff as Violet, and George Bell as Taylor, Maud’s laundry boss. 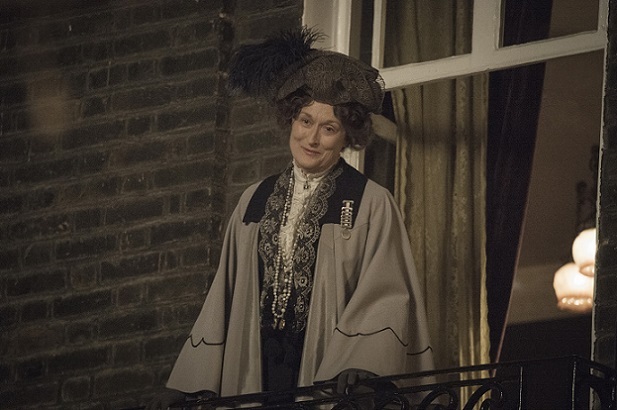 There is also a small cameo role from Meryl Streep, but her presence is not really necessary, although she throws herself into the role with her usual aplomb (any English actress could have played this role, but maybe it helped to get the project up and running). There are many other characters of note, as it is a great ensemble film that tells a story that still needs to be heard by a new generation. It is a film with a very strong message that words are sometimes not enough in the fight for rights (one hates to condone the militarism, but it was the only way that women finally achieved the right to vote and be heard). 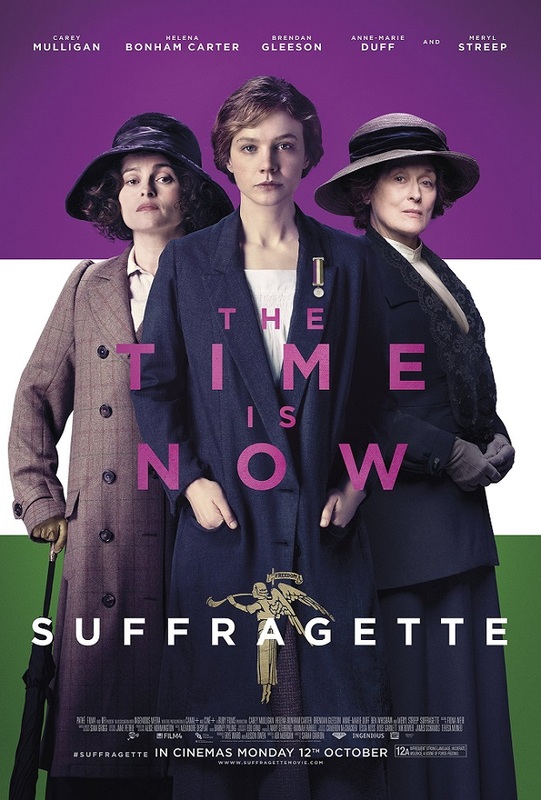 This film should be watched by a wide audience as a testament to a very important time in world politics for women that is played on the screen with grit and determination and a passion for life that one can hardly believe took place a century ago!